In late January 1994, my wife Robin and I experienced a genuine “life-changing event.” While many of our friends were having children or buying homes, Robin and I were drawn into one of the great historical dramas of the 1990’s: what has become known in the press as Gulf War Syndrome. As part of her Women’s Executive Leadership (WEL) program experience, Robin decided in late January 1994 to solicit a fellowship on Capitol Hill. Using some Agency contacts, Robin discovered that the Senate Banking Committee was in need of additional staff to work on its ongoing investigation into the possible link between alleged chemical exposures and illnesses being reported by Desert Storm veterans. After reading the committee’s original September 1993 report, I became interested enough to start digging into the CIA’s historical files to see what corroborating evidence I could develop. 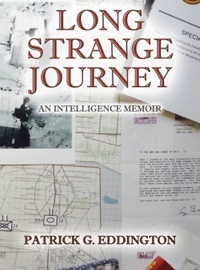 That simple step evolved into a two-year odyssey which culminated in my resignation from the CIA in October 1996 and the subsequent release of my book on the subject, Gassed in the Gulf. 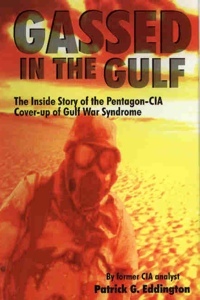 Gassed was published in August 1997 by Insignia Publishing Company; the paperback version was published in July 2000 by iUniverse in collaboration with the Authors Guild. I’m gratified that the book was so well received by the veterans’ community. Video tape copies of my June 1997 and August 2000 appearances on CSPAN’s “About Books” and “Book TV” are also available for purchase directly from CSPAN. Mr. Patrick Eddington… I served with NMCB-24 during DS/DS 90-91 and would like to speak with you in person by phone if at all possible. Please call EO-3 George Kernaghan at: 816-674-0426. I am asking for your help and have information which may be of intrest to you about enlisted personnel who served with NMCB-24 during that time. I am available evenings, nights and weekends, anytime. Hope to hear from you very soon. Thank you, sincerely, George Kernaghan.